Every issue, landscape designer Darbi Davis digs deep to bring you stories for your outdoor space. 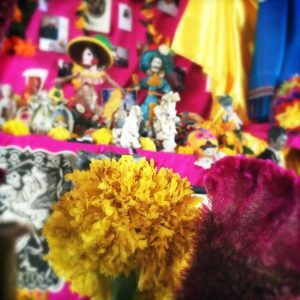 This month we celebrate la flor de la muerte, the marigold. 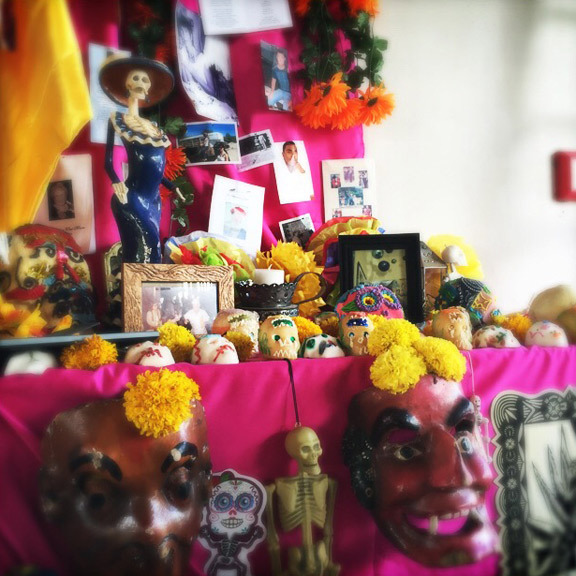 This Sunday’s All Souls Procession in Tucson will be packed full of the symbolism that surrounds the Mexican holiday. 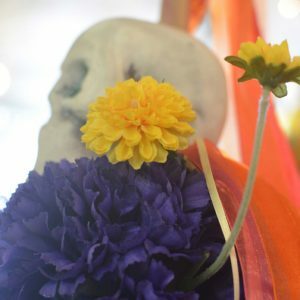 One of the things you’ll see a lot of during Tucson’s long procession, a surreal and soulful celebration and remembrance of the dead (see our feature, Design de los Muertos), is the radiant “flower of death”, the cempasuchil, or Mexican marigold. 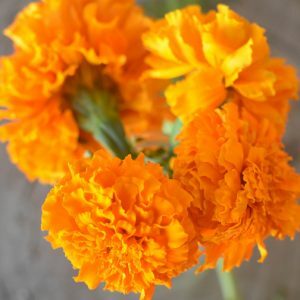 Marigold flowers are brilliant and fluffy with dark green leaves. The cempasuchil is part of the genus Tagetes (not to be confused with Calendula, or pot marigold). They are the color of the sun, and available in multiple species exhibiting varietal flair, from petite and dainty to boldly flamboyant, as in the Tagetes erecta. Only the latter will suffice for Day of the Dead celebrations. Marigolds are a rough and tough plant – sometimes referred to as a weed. They are native to the Americas, from Argentina to Central Mexico, and even Arizona. In central Mexico they grow wild in abundance, making them an easy flower to cultivate tradition because of their availability. Their relationship with death is rooted in the subterranean layers of Pre-Columbian culture, fused with Catholic theology. Historically, they endured transcontinental transport only to exhibit resilience and adaptability. Perhaps this is why their relevance remains alive today. Marigold’s are pillows of sunshine, with velvety, pungent petals – expressive qualities perfect for brightening death, a topic typically masked in darkness. In the Day of the Dead tradition, cemeteries transform into sacred museums exhibiting pointillist paintings comprised of petals. The subjects are symbolic religious themes. The results are gravestones gilded in gold. The artists are alive. Hispanic tradition perceives death as merely a transition of life and, this time of year, they believe the gossamer web separating life and death is penetrable by the souls – but only if they are properly welcomed through food, dance, and of course flowers. Pathways of marigold petals weave through cemeteries providing a rich, vivid, and aromatic visual queue that guides the spirit’s journey home. Marigolds are drought-tolerant, enjoy the sun (maybe filtered a little in Tucson), and do not mind poor soil. That makes Tucson the perfect place for them to thrive, particularly in the fall. They are a great companion plant in an edible garden because of their ability to repel pests below the surface and above. Tagetes erecta is the seed to collect – either from the store or a garden. The seeds are large and easy to handle and distribute. They prefer a warm, moist environment to germinate but, once they do, they like to be ignored. If you plant them in your garden, set them in the background because they grow substantially tall. Let them do what they want or give them extra attention to glean a greater bounty. Either way, you won’t regret it. Ironically, I have one little marigold seedling that popped up out of nowhere in my front yard. It happens to be the large Tagetes erecta. Granted, it looks silly all by itself. But it has buds that look like they will open just in time for the All Souls Procession. Sometimes I can’t help but ponder those wayfaring ancient spirits. • The All Souls Procession takes place on Sunday November 9th in downtown Tucson. More details here and in our feature, Design de los Muertos.